Dr. Shirley I. Metcalf is the fifth president in Central Oregon Community College’s more than 60-year history. She assumed the position in September 2014. Dr. Metcalf has been at COCC since 2011 as Dean of Extended Learning, overseeing the college’s non-credit instruction and the COCC campuses in Redmond, Madras and Prineville. This included the Small Business Development Center, Continuing Education, Professional Development and the College’s programs at the Deer Ridge Correctional Institution. In 2013, from February through June, she served as interim vice president for instruction. In her first year as President of COCC, she was named “Woman of the Year” by The Source Weekly newspaper and selected as one of Bend Chamber of Commerce’s “Women of the Year” nominees. 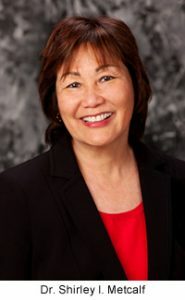 She serves as a board member for Better Together and the National Asian Pacific Islander Council, an Affiliate Council of the American Association of Community Colleges. Dr. Metcalf is an avid skier and enjoys traveling with her husband, Wayne.